Have you seen the giant red backpack? If You See Something, Say Something. 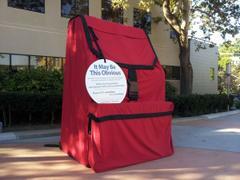 Have you seen a giant 10-foot tall, red backpack on Ring Road? The backpack is a highly visible and compelling reminder for people to use common sense to report things that do not seem right, such as an unattended object left in a public place or near important buildings. If You See Something, Say Something. An alert public can play a role in keeping our community safe. Simply, be aware of your surroundings when in public and report something that does not seem “right." What is something that is not “right?” As you go about your daily routine, you know your surroundings and no one can spot something odd or out of place better than you. You are encouraged to use common sense to report questionable objects or behavior that could be indicative of terrorism. Reporting to the authorities is simple. For imminent threats, always call 9-1-1. Otherwise, call your local police department. UCIPD's non-emergency line is (949) 824-5223. Most importantly, DO NOT take direct action, confront anyone, reveal your suspicions or touch an object. Just contact the authorities. The campaign does not promote spying on others or making judgments based on a person’s race, ethnicity, national origin, or religious affiliation. Community members are encouraged to report situations and behavior as possible terrorist or violent acts rather than beliefs, thoughts, ideas, expressions, associations or speech unrelated to criminal activity.